The opening week of the Giro is done and time to look back in order to help look ahead. It’s been a lively week of racing, perhaps with some dull moments if you followed the stages live on TV for too long but otherwise the outcomes have been varied and thanks to the Blockhaus the race has been shaken up. The start in Sardinia was scenic but once you’ve seen an hour of azure waters and sandy coves you’ve seen enough although before all of this started the race was shocked by two Bardiani-CSF riders testing positive for growth hormones in an A-sample. The B-samples get tested this week. If the race was rocked, it was a small wave rather than tsunami and wasn’t enough to spoil the party. Team management put out a clumsy press release saying they were ready to fire the riders while sponsor Bardiani was much more articulate with a statement explaining their attachment to developing young riders. Youth was a theme for the first week as neo-pro Lukas Pöstlberger made a name for himself with a stage win and the maglia rosa. André Greipel got his stage win to keep up his record of winning at least one stage in every grand tour he starts this decade and then the third stage was part bike race, part sailing regatta as fierce crosswinds split the bunch and Quick Step amassed on the front like they were in De Panne to set up Fernando Gaviria for the stage win and let Bob Jungels take time which would propel him in the overall lead. Etna loomed but if it’s an active volcano it doesn’t erupt every day nor is it an open cauldron of fire and brimstone. Instead it’s a high peak exposed to the wind and we got the sight of the front group spread across the road in echelon formation on a mountain top finish. While they huddled, Jan Polanc took the stage win on his training roads. The next day they rode to Messina and after a pounding across the potholes Fernando Gaviria won another stage thanks to his speed and team work from Quick Step. Silvan Dillier won the stage to Terme Luigiane, beating Jasper Stuyven in the uphill sprint. The finale was exciting and the stage itself was instructive because if many teams have come with plans for the overall classification, some have not and they can’t afford to miss out on days like this so we saw the likes of Willier-Selle Italia and Cannondale forced to chase but this just cost them kilojoules and wooden legs. Willier manager Luca Scinto roared at his riders and told La Gazzetta he was minded to send half the team home. Certainly knowing that if you miss the move you’ll have to chase anyway is an incentive for some to go clear. Caleb Ewan finally took the stage win he needed in Alberobello after a string of mistakes by him and his team in stages prior but worth remembering he’s still eligible to ride in the U23 ranks and despite the hiccups he seemed to keep his cool. Movistar lost Ion Izagirre to Bahrein-Merida but brother Gorka stepped up with a stage win in Peschici after a very lively stage and what the French call une course de mouvement with the scenario constantly changing. It took an hour of 50km/h racing for the move to go clear. No sooner did it go did Luis Leon Sanchez bridge acrosss. No sooner did he get across did Gazprom give chase. No sooner did the chase peg the group back did several riders use the slopes of Monte Sant’Angello to bridge the narrowed gap and so on. But for all the action the race reached Sunday and the stage from Montenero di Bisaccia to Blockhaus with 16 riders within 23 seconds of Bob Jungels. Sunday’s stage to Blockhaus was set to be the first shake-up for the overall classification. Mikel Landa crashed soon after the start. in a lively start to the race that saw Cannondale try to get Pierre Rolland into the lead group by chasing down the breakaway: let Rolland bridge to the move or we’ll chase you down. But the breakaways came to nothing as Movistar thundered along the approach roads to the Blockhaus climb. They rounded a bend and suddenly there was a motorbike of the Polizia Stradale parked on the edge of the road. The officer had been told to stop and let the front group pass so that he could protect one of the many smaller groups of riders that had already formed behind from riders ejected by Movistar’s pace. Only the officer didn’t get off the road and was stopped on the tarmac. The riders rounded the bend and found the motorbike in their path ahead. Tom Dumoulin managed a feline swerve around the bike but Wilco Kelderman caught the side boxes and the bars, fell and set off a wave of crashes that brought many others down. It wouldn’t be the Giro without a polemica but there’s one thing that’s certain: the motorbike should not have been there: it should have either been off the road completely on the grass verge or if you have to park in the road then the habitual place is on the right side of the road (you’ll always see riders with a puncture and team cars stopping on the right). It was a mistake pure and simple and frustrating on the simplest of levels because if you can’t count on the police, who can you? But the police regularly do a great job and themselves take risks as they speed down descents to open the road for the riders, no easy task on a 250kg motorbike laden with police kit and they collectively deserve support for their work. This wasn’t an institutional fault, just a human error but one that had a big price and it casts a long shadow on the race as it took out Geraint Thomas, Mikel Landa and Adam Yates. All would finish the stage but at 5m08s, 26m56s and 4m39s respectively. “Game over” said Thomas after the finish line. He limited his losses well after reports he’d dislocated his shoulder and rode up with his clothing and skin shredded. We’ll see what Thomas does next, as suggested in the pre-race preview the Giro was a test for him in several ways, to prove he could lead a team and to cope with the three weeks as well as “fight for pink”. The first two objectives still stand if he can hold; in the past we saw the likes of Richie Porte fade on a setback so Thomas can still prove resilience, especially as the boss seat on the team bus at the Tour de France and the Vuelta are reserved for Chris Froome. Sadly this incident spoils some of the sport and removes three contenders, all because of a badly parked motorbike. Should Movistar have sat up? There’s an unwritten rule where it can happen but this is cycling and even the written rules are applied inconsistently. The unwritten ones are a palimpsest of circumstance, mood and precedent. It could have been a nice gesture but crucially Movistar had been driving the pace already, they didn’t seemingly accelerate to profit from the misfortune but kept doing what they were doing on the approach to the climb. Both sides have their merits when reviewed on a Monday morning in an armchair with a copy of La Gazzetta in your hands, let alone in the broiling heat on the flanks of an Abruzzo mountain. Back to the racing and Nairo Quintana could not be matched on the climb. Yet he only took 24 seconds from Thibaut Pinot and Tom Dumoulin, both superior chronomen. So Quintana has established himself as the best climber on this one finish but he hasn’t gained the time needed. Pinot and Vincenzo Nibali both followed Quintana’s moves as best they could but Nibali paid the price for this and cracked. Behind Tom Dumoulin did his thing and evenly pacing himself up this uneven climb saw him end the day only 30 seconds down on Quintana overall which will be very encouraging ahead of Tuesday’s Montefalco time trial. Wilco Kelderman left the race and if he wasn’t going to challenge overall he was going to be Dumoulin’s lieutenant in the mountains and given Dumoulin paces himself having an even wheel to rely on is so valuable only this is gone. But like the 2015 Vuelta the question is whether Dumoulin can keep going for three weeks but we’re only posing this because he looked so smooth on the climb yesterday. Bauke Mollema didn’t look so comfortable but he never does and sits fourth overall to face the same question about his ability to hang on in the third week. The third Dutchman Steven Kruijswijk is now three minutes down but he’s come good later in the race before. Pinot looked good on the climb yesterday and can fare well in a time trial but could well be caught between two stools, one minute watching Nairo Quintana float away up the road, the next looking over his shoulder to find Dumoulin. Pinot has beaten Dumoulin a time trial before at the Tour de Romandie but it featured a steep climb into the vineyards above Sion and a risky descent whereas tomorrow’s Montefalco course might have a few vines but it’s all about who turn spin the biggest chainring possible while tucked into the most aero position. Meanwhile Nibali is doing well, he might have cracked yesterday but that’s only because he could follow Quintana and Pinot when others could not or dared not. But he’s down a rider after Javier Moreno’s expulsion and even the Bahrain-Merida team bus has broken down, but no worries since the team started with two: one for the riders and another for VIPs and the guests are presumably slumming it on a rental bus. This position suits Nibali, he can bide his time and gives hope to the Italian fans still hoping for a home stage win, a topic La Gazzetta Dello Sport has featured a lot already. What next? The time trial on Tuesday, it climbs in places but for the most part is a test of brute force. Wednesday promises a lively transition stage through Tuscany and a big battle just to get in the breakaway, perhaps the fuoriclasse Valerio Conti will recover for a home win? Thursday and Friday are blogger’s rest days, aka sprint stages and also time for wounded climbers to heal. Saturday sees the race reach the Alps with the punchy Oropa finish before Sunday’s small Giro di Lombardia, a mini classic mid-race. That’s plenty of racing and the weather forecast for Italy looks good for the week with warm sunshine predicted. Then the snowy peaks arrive. Finally a revision of the picks for the Giro. We’ve only had one summit finish and with so much more to come things are still vague. Quintana tops because if he can poach 30 seconds on a climb here or there then that will stack up in the final week. Dumoulin looks likely to assume the overall lead but holding off Quintana is a tall order while Pinot can chip away on the climbs too. Mollema and Nibali can each have their say too, Mollema is capable of a good time trial while Nibali will plan his surprises and wait for the descents. Thomas still gets a chainring because if he can time trial his way back and show what could have been then he can close the gap. One significant summit finish anyway. A self-destroying comment: there is only one “l” in Wilier Triestina. PS All those cees and gees and other fancy letters of the alphabet are strangers to native Finnish speakers and therefore they may sometimes seem quite interchangeable or at the very least the difference goes unnoticed when pronounced. I have a riding buddy who keeps calling his Cinelli a “Sinelli” and another who calls his Colnago “Kolnako” andf writes it as “Golnago”…but let’s face it, I’m an insufferable snob, sometimes. And a spelling Nazi to boot. What I commented yesterday is that Dumoulin is going to be in pink tuesday night, and that it’s each other rider’s task to pull the jersey off him. I would like to hear your opinion about Sky: do you think they can play a “fantasista” role? sth like crazy early attacks, whole team moves and “ambushes”? Or – as it is more likely IMHO – Thomas will try to get into the top 10 and to cautiously get by until the last stage? thank you so much for all you effort. Here in Italy we love your columns! Landa certainly has the room to do this now and with him out of contention maybe a team mate or two can be used to help him, eg in a relay move. It all depends on the injuries but Landa can almost use the TT as a rest day and have the rest of the week to take his time too. Even as someone who dislikes Sky – always have and always will as long as they’re sponsored by the Murdoch empire (not to mention their various drug issues after so much preaching) – I find some people’s glee at this event perplexing to say the least. Not being a fan of any particular team, the race isn’t ruined for me (and I don’t really understand that attitude), but it is significantly less interesting with three big contenders gone. Hopefully, Dumoulin and Pinot will make it a contest, and Nibali could still come back. The bigger issue is that motorbike incidents keep happening – some of them much more serious than this. Even if this one is not related to having too many motos – get rid of most stills photographers; share photos, for a start – it’s yet another motorbike mistake. And their behaviour generally in this Giro has been poor (crowd encroachment has also been an issue – and there was that marshal in the middle of the road the other day). Motorbikes have also consistently been too close to the front of riders – how many races have we seen this season where the bike is in front of one group (usually the peloton) and behind another (usually the smaller group in front)? At least do the same for both groups: it’s pretty simple. – but his lack of action on motos is disgusting. This is a major safety issue and has been going on for years now. The person at the top is responsible. He’s proven he’s not up to the job, so time for a change. We know how much you dislike Cookson (and I made the mistake earlier of going on the Cyclingnews blogs) but the UCI are stuck trying to keep both the teams and ASO happy. Both groups effectively have a veto over any decision that the UCI try to make and it must be extremely difficult to negotiate a path between them. I am yet to be convinced that anyone else would do a better job and, if they are beholden to one side or the other, it could be a lot worse. Do you have someone in mind who should take over? Nothing to do with like or dislike – it’s whether or not he’s good at his job. As for who should take over I guess the likely option is Lappartient. No idea if he’ll be any good, but as when Cookson took over it’s ‘anyone but the incumbent’ (and Lappartient does seem to care about cycling as opposed to Cookson’s ostensible love of money). Is it the UCI or Cookson that’s the problem? No idea. But as the current situation is demonstrably not working and we don’t have the option of getting rid of the UCI it’s time to try someone else. A lot of complaints in the last two years or so about motorbikes, but none of us can do anything about it. The guy who should be able to do something hasn’t. The riders should also step up and organise themselves: you would hope they would do more to secure their own safety. You can’t expect your employers to care: none do. But UCI is not the riders’ employer. And that gets at the problem Tovarishch was mentioning. It’s even more complicated as the employer is the team. The UCI is essentially like OPEC, a consortium of producers, and look how well that’s done getting oil prices back up. Neither has any real influence on any part of the market. ‘But UCI is not the riders’ employer.’ – nor did I say that it was. I thought it was obvious, but to try to explain in the simplest terms: the riders have to demand better safety from the UCI because their employers – the teams – are not going to do that. “Cookson’s ostensible love of money”. You really have got absolutely no idea, have you? Keeps suggesting the Vuelta goes down to two weeks so that new money-spinning races can be put in those calendar slots. The new WorldTour races: are Turkey, RideLondon, Qatar and Abu Dhabi really deserving of being at that level? Do you honestly believe that money paid no part in that decision? Has consistently allied himself with Velon whose interests, it can clearly be seen, revolve around money, not good races. Those are just three of my ideas about Cookson – do you have any ideas? Speaking generally, there seem to be an awful lot of people with complaints about safety, but at the same time a massive reluctance to demand that anyone actually takes responsibility for that. The UCI run the sport: they’re responsible. They haven’t improved matters when it comes to motos. As it is, Tovarishch, you have excused the UCI from doing anything from the very beginning saying that they can’t do it because of ASO and the teams. If they tried, you might be proved right. As it is, they’ve done very little. Well actually, they have. In February the UCI published their ‘Guidelines for Vehicle Circulation in the Race Convoy” in a direct response to the growing issues of moto/car related incidents. And they are on the UCI website for anyone to look at. Quite good and clear about setting out proper conduct for vehicles. And they are linked to various penalties in the larger UCI rulebook. But it is then, as i understand it, down to the specific race organiser (ASO, RCS, Flanders etc) to enforce the guidelines and rules like they would with other aspects of course safety. To give an example of a similar idea: If someone is running a marathon and gets knocked down by a following camera, the blame falls first on the camera person, then on the organiser of the individual marathon. Not onto the IAAF (assuming they’ve got a set of clear and appropriate rules). They’ve written some stuff down – hence I wrote ‘As it is, they’ve done very little’ – but as we keep seeing things have not improved. It’s not enough to have rules you have to enforce rules – something the UCI perpetually fails to do, on all subjects. The UCI was not responsible for the farce on Ventoux last year nor for this latest incident (though inclined to think this was simply happenstance) nor for most of the other “incidents” The folk at ASO and RCS who seem so keen to take over the running of cycling (so they can make bigger profits) dont actually seem capable of running their own races without incidents, more than happy to shift blame onto others especially the UCI rather than take responsibility. Not sure how much control the UCI, and Cookson as an individual, have over Police out-riders. From my, admitedly, small experience of cycle organization the “blame” should go to RCS not the UCI as it’s RCS that does the interaction and work on a day-to-day basis whilst the UCI sets overall guidelines. In this incident it’s more about the out-rider either not knowing or not following the guidelines. If it’s not knowing, then “blame” should fall onto the police or RCS and not the UCI. If it’s not following then the “blame” falls on the individual. It’s perfectly clear that I was talking about the motorcycle problem, generally. It seems to me that you want to pin anything and everything on Cookson. Now I agree he is not the most effective of people but I also wonder what you would have him do. I also wonder if you understand how cycling is governed. The UCI can make any amount of rules and regs but its races and race owners who police their own races. If they don’t follow the rules Cookson is pretty powerless to act. In truth the UCI is a pretty toothless organisation due to the way cycling had developed historically and to the way it currently works. If Cookson had any real power maybe he would do something. Right now he is strictly limited in what he could do. The UCI have improved things on the moto front but don’t expect the UCI to be powerful, they’re not. Cookson can’t order things, as we’ve seen with his mooted World Tour reforms, he could not get them through because others – largely ASO – said no. He and the UCI are weak when it comes to men’s pro cycling and can only govern by consensus, when others are in agreement. My point is that the UCI should come up with moto safety solutions. Then if the race organisers/teams/whoever don’t implement them/fight against them, the UCI can say ‘Look, we tried to do this and they stopped us’. That might pressure the others into not going against the UCI. They could act like a leader on this. They could try to force these things through – it’s not the same as trying to get ASO, et al to agree to their WorldTour ideas (which they did just come up with and try to force through). As it is, they are having little or no effect in this issue – and you need someone who’s going to step up and doing something. Cookson, I feel, is far more concerned with winning the election and thus is afraid of ruffling any feathers. As i mentioned already, the UCI did come out with a set of guideleins for vehicle safety. 30+ pages covering the subject, far more than most of their other safety regulations in terms of length and far better in terms of clarity. It is the race organisers job to enforce them on the ground, all the UCI can really do is revoke driver licenses (which is hard when it’s a third party like the Polive are). Anything else will be highly contested by the race organiser who’ll shift the blame to the third party, who’ll shift it to someone else. I’m not sure any UCI president would be able to make all motos 100% safe. Because most of the accidents caused are not a result of bad rules, but individuals making poor decisions or bad luck. Take this incident, the moto had followed the guide to pull as far to the side of the road as possible but the mistake was that he should have pulled more off the road and in a place with better visibility. That’s not the fault of the UCI, it’s the fault of the individual. The race is interestingly poised. NQ did well yesterday but was it enough? There are not that many uphill finishes this year and Blockhaus was probably the most difficult. I have seen it suggested that NQ could well loose 3 seconds per kilometre to his main rivals in the time trials. Given that there is well nigh 70km of time trialling that amounts to around 3.5 minutes he needs to make up on the mountains (assuming you accept the 3 seconds thing). Both Tom Dumoulin and Thibaut Pinot looked in good form yesterday and on shorter or less steep climbs could well find it easier to match NQ. As the article notes it is too early to count out Vincezo Nibali, though I have my doubts. Perhaps NQ’s form will improve as the race goes on (it has in the past) but the Giro also has a habit of throwing up elephant traps when least expected. The weather in the high passes might also be a factor, the webcams show folk hard at work clearing the Stelvio, with the typical big snow banks at the top. The weather forecast for next weekend is snow (not sure how heavy) though for Tuesday itself dry but cold (0 degrees). If that stage gets curtailed then NQ’s potential advantage is even slimmer. I’m going to give Nairo and Movistar the benefit of the doubt that they’re smarter than anyone seems to give them credit for. Why did he need to do any more yesterday than draw the rest out to see what they had? All for an ITT not even halfway into this monster? As if that’s the deciding moment? With the “snowy peaks” looming on the horizon (where he will likely have his way with the tour)? He did what he needed to do while keeping sight on this being only the first of two tours to win. If I was Quintana I would not count on the Extreme Weather Protocol coming into play – the teams who stand to benefit will take any opportunity to attempt to use this. I also think he’ll lose a fair chunk in the TT’s – maybe around 2 minutes to Dumoulin. Q should take every chance he has in the mountains and he should attack from greater distance in order to take more time – not just rely on attacking on the last climb, but being adventurous (anathema to Movistar) and using his superior team to go from distance. Great first week summary. Enjoyed all of the race so far, despite what happened yesterday I am not discounting riders for the podium yet. To finish first, first you must finish and there is a long way to go, safely, hopefully. Too many motorbikes? yes, but I don’t have the answers. I think yesterday’s incident was unfortunate as it stopped Geraint Thomas, Mikel Landa (who I assume is more hurt than he looked) and Adam Yates finding out how they would have rated on the toughest climb of the Giro to date (and possibly this race depending on who you listen to). But it’s hard to criticise Movistar as I think most teams would’ve done the same in their position (and Thomas didn’t criticise them after the stage, unlike Matt White). I think both Thomas and Yates can make the top 10 but will that be enough? I assume Yates, A is pencilled in for the Vuelta but Thomas has a date in France in June/July so the possibility of an early flight home comes up. Very fine ride by Dumoulin and Pinot though, which has brought the race to life. Had Quintana put more than a minute into the second placed rider you suspect it would have been pretty much all over bar the shouting. Landa was not taken out by the crash, he managed to crash all by himself and almost took Pinot out as well. Can you post a video of that? I haven’t seen that. If Landa is the Sky rider on this video who crashes into an FDJ rider you can clearly see that his team mate’s bike hits him, causing him to crash. But I don’t know if that’s Landa or if you’ve seen something else on a different video. Question – where do people think Thomas or Landa or Yates would have placed? I’m going to stick my neck out there and say – I think Thomas would have been behind Q but ahead of Pinot. I’m going on recent form and Thomas’ Welsh grit + I think he has a tendency to go for it early rather than ride to a plan so would have followed Q until his body said no not thinking of later race consequences. Landa I personally think is the only climber in Q & Froome’s realm currently (Yates’ will get there as might Pinot) – I just can’t say if his form would have equalled Q’s so going to say he’d likely have finished with Pinot. Maybe the crash earlier though would have affected him? Yates – impossible to say, he’s the tracker supreme so possibly also with Pinot & D? What a crushing disaster for the Giro to have lost three contenders in one spill. When was the last time three genuine podium riders were taken out the race like this in one stroke? I assume Geraint will be more injured than he lets on and his performance in the remainder of this Giro won’t match his capabilities. THREE CONTENDERS ARE NOT OUT OF THE GIRO DEREK!!!! The incident almost took Doumllin & Pino out of contention as well. Had that been the case, the Giro would have truly be over. Though Doumllin’s weak team is weakened further. Just one thought, whilst such random incident is truly quite difficult to avoid, and the motor rider did stop out of good intention (stop to drop behind peloton so that he can protect riders shelled off the back), could an advisor attached to the police dispatch avoided it yesterday? The advisor probably can be a respected ex-rider elected by the union. He sits with the police dispatch (or the TV crew dispatch as well). And whenever some decision is made, he can see if it is in line with rider safety. In yesterday’s situation he can remind the police rider that he really needs to be off the road and preferably to the right hand side of the road or use side roads to wait. On other occassions, he can point out that a camera motor is too close to a rider to the TV crew (there were instances yesterday when the camera motor leading the head of the race had to slow down significantly due to fans on the road and Quintana very almost ride into the back of it. thomas has still there to aim for his best Grand tour result in his career so far (15th is it now). if yates landa and thomas really have podium quality they could still finish in the top 10, maybe in the top 5. in the last three giros the fifth was 4-10 mins back, the tenth around 15 mins. In 2014 our beloved Pierre Rolland was 5.45 mins back in gc after twelve stages. in the remaining 9 stages he lost one more second in relation to the maglia rosa and finished 5.46 back. Landa is 27 minutes down and, in his own words, “on one leg”. How does he top 5 from there? true, my bad. it was more coined on yates and thomas. Not that I say it is easy, the psychological blow might let you definitely down, but Yates can go for the White Jersey and a good GC isn’t totally out of reach for Thomas, who, as ronytomy wrote, doesn’t have exactly a luxury palmarés in that sense. The mountain jersey is still doable even for Landa, and there’s a lot of easy time to recover meanwhile, as I showed in another comentary (unless some fierce battle is suddenly started on the Appenine). Besides that, epic stage wins, or even just epic racing, tend to be more worthy than, say, an anonymous GC placement. I’d challenge anyone – direct fans apart – to defend that König’s 2015 Giro was more significant than Kruijswijk (hundreds of examples available). +1 Rather than offend anyone I’ll just leave my comment at that. Impossible to say, of course, but if you take a simplistic approach and knock off the 2.30 or so that it took them to get back on their bikes, then Yates was at about 2 mins and Thomas 2.30. That includes the effects of their injuries and having to chase back on, rather than following a more consistent pace. Add that to previous form, and it wouldn’t have been a huge surprise to see both of them finish somewhere between Pinot and Nibali. As Landa and Thomas rode round Trentino together, you’d have to assume he’d be in a similar ball park, though clearly he was more badly affected by the fall and cracked rather more than the other two. Your figures, as such, are fine only for Thomas, who indeed made a great climb. Obviously, it’s to be seen if he was going to make the same “mistake” (in time difference terms, I think that strategically that could make sense) of Nibali and Pinot or if he could pace himself along with Dumoulin, to end up with Mollema, as you say (and I believe it’s the most probable scenario). The presence of Landa may hace changed *completely* the stage, depending on how he decided to behave and on his actual performance (always a mistery with him, especially on the first hard stage). We might have had he and Quintana a long way ahead and the rest all together at 1′ or more, or even a group of nine-ten riders in a few seconds, separated by a last km sprint. I said it was simplistic :-). Apparently Thomas lost 2 mins on the climb itself and Yates 3:50. I’m of the view that Quintana didn’t do enough yesterday but there are, of course, significant ifs and buts involved in that judgment. What if Dumoulin can still storm the ITTs even in his new climber’s body? 70kms of ITTing is a decent amount and we “should” be talking about minutes of difference between him and Quintana there. I don’t think 4 minutes is over-egging what’s possible. He took 3.08 from Quintana in one 37.5kms TT alone on stage 13 of the Tour last year. The two ITTs we have here suit Dumoulin well also. Of course, he will continue to lose out on the mountain top finishes but I think (hope!) Quintana still has much work to do. Certainly I think Tom is badging himself up for the podium at the least. The biggest “if,” of course, is if he can race to the end without cracking. I tend to agree with the general perspective, even if 3′ for the first ITT is a quite extreme upper limit, IMHO: although the Tour ITT was hillier than tomorrow’s (note that RCS changed it some time ago, making it easier than the original version! ), Dumoulin was focussing on TTs, then, and he put in a monstre performance. Nobody came less than a minute close! Well, Froome nearly did (1’03”), but the third was already further 30″ back. Thomas, T. Martin, I. Izagirre were 2′ back. Also note that Dumoulin had just spent the Ventoux stage *resting* (came in with more than 20′ back), while Quintana was suffering after three hard days in the wind. I think that tomorrow a difference between Quintana and Dumoulin around 2′ might be reasonable, albeit 3′ can happen. Less than 2′ would depend on Dumoulin weight lose. The last ITT depends on a lot of factors, morale, exhaustion… but it’s not short and it’s for pure specialists. Quintana might easily lose one minute. A total loss of 3′ looks more realistic to me, 4′ would be special but not something you can’t see happening. Like you, I was thinking that Quintana should have gone harder, too, before the discussion between you and Gabriel on the previous post prompted me to go and look for data. Now I think that going much faster would have been an out-of-this-world feat, especially if he isn’t in very top form yet. 6.1-6.2 W/kg for 40′ is a lot, it’s a very high level climbing performance. It’s Dumoulin who was really impressive, consistently with his very good first week performance ever, but even more excellent because of the characteristics of this specific climb. (And apparently we might start to say that he likes hot weather). I’m also curious to see if Pinot’s improved TT skills can be applied to longer and flatter TTs within a GT. Another factor to consider is that this was the first really hard climbing day so everyone had relatively fresh legs. The last climb put gaps that are more similar to a week long stage race which is basically what the riders had in their legs by that point. Add another week of racing and then let’s see how people are feeling in the third week. That has been the downfall of riders like Porte, Thomas, and Dumoulin (2015 Vuelta) in the past. All it takes is one bad day and riders like Quintana and Nibali can put you to the sword. I’m joking, yet: two rest days + two totally flat stage + two stages which barely exceed 1,000 mts of altitude gain (beginners’ club ride level) – the latter two are next weekend. What else? One flat ITT, tomorrow. The enigmatic Appenine stage, on Wednesday. A lot will depend on attitude, but there’s plenty of space to limit damages and recover properly before the decisive last week. The Appennine stage is the only one which could entail any trouble for the injured riders if it’s tackled fast & furious, but the day before ITT may mean sore legs for the best. It’s a relatively short stage (160 km) and the first half is the hardest, then it’s mostly false flats with rare, short and isolated 1-2 kms 8-10% ramps until 30 to go where you face 3-4 pretty hard kms. The long easy sections (20-25 km) both before and after that pitch – a soft 3% rise before and an easy descent afterwards – should limit offensive potential, unless the bunch arrives already broken at the halfway point. Agree. Whatever one’s thoughts on Sky, it was horribly cruel for the three riders and is to the detriment of the race overall. Landa and Yates were perhaps the only two climbers strong enough to challenge Quintana on the Blockhaus, while Thomas was also looking good and would no doubt have won back some time on Tues.
We can only hope that their teams now try some aggressive and unpredictable tactics in an attempt to recover some losses, or that they go on the hunt for some stage wins. Great ride by the Dutch pair. Will be interesting to see how both fare in the later stages of the race. Ironically I think yesterday was the death knell for Dumoulin. Yes, he was great, and yes, he was much closer to Quintana than I realistically could have thought. But he will be in pink come Tuesday, barring any miracles. And he will hold onto it well into the third week (if he is, say, 1.10 ahead of Quintana, Quintana won’t make that up on Oropa). But he’s lost Kelderman. And much as you disqualify Kelderman in this article, his GC credentials are pretty darn close to the likes of Thomas, Landa and Yates, as well as Mollema, Zakarin and Pinot. He would have been so vital to Dumoulin, Kelderman was in superb form this Giro and he rides the same way as Dumoulin, TTing up a mountain at a steady pace. Without him Dumoulin becomes a lighting rod and as smart, stable and calm as he is, he’ll never survive. So despite his amazing Blockhaus, yesterday Dumoulin lost the Giro (for whatever chance he had of winning it). Pinot is the closest competitor to Quintana, followed by Nibali. The two Dutchies, sadly, will come up short for the podium yet again. Kelderman does seem like a big loss. I want to see how Dumoulin copes on a mountain stage with repeat climbs, it’s one thing to do Blockhaus, another when you have climb after climb. Kelderman is a big loss, indeed, but as Contador showed in 2015 what matters the most is to have the “mule power” in your team to shut down dangerous early moves by your rivals’ teammates or other reference points to which a stronger climber could bridge up. Few stages (or none) offer big chances for Quintana to get back big chunks of time from Dumoulin without the Dutch having the chance of coming back strong in long final descents or flat stretches. Oropa and Piancavallo are good for Dumoulin on paper, they’re monoclimb and anyway they’re too short to make a huge difference – all this, unless the rival cracks by himself. Hence, Movistar has got to wear Dumoulin out climbing fast on every Gpm and/or to launch ahead from scratch several riders in order to support a possible later attack from Quintana in the hardest stages… whose finale is always relatively easy (not at all comparable to the Vuelta situation, where Dumoulin admittedly would have cracked on the last climb anyway). The first option ask for sheer resistance (after all, Dumoulin climbs better than most Movistar’s gregari), the second one needs a solid defense by the likes of Ten Dam, Preidler, Geschke – you wouldn’t have used Kelderman like that anyway. And that was the problem in Spain, too. Not as much the lack of a strong gregario on his side, as the capability to prevent Astana’s strategy from the beginning. Looking at the climbing times on yesterday stage and it seems that Thomas only lost 2 minutes to Quintana despite the injuries and the fact he was chasing. This, for me, shows that if his injuries aren’t too bad and he doesn’t crack, there is still a podium place for him. As has been previously mentioned, I think the biggest loser out of yesterday will be Dumoulin losing a key domestique. A quick glance at Stage 18 would suggest that it’s tailor made for someone of Nibali’s skillset. ~35 km of descending before a shortish final climb. Blogger’s Rest Day? I am still smiling ear to ear over that one. Thank you! And it certainly isn’t your quantity of writing that brings me here, although I like the way you adjust your word counts, as much as the quality of your work. And that is an even bigger smile for us! And thanks for all your thorough and thoughtful coverage. I don’t like the accident with the motorbike, but how can you not love Geraint Thomas for his reaction :). He was mad but as he said, it’s part of the race. That guy is always looking on the bright side of life! Absolutely so. A friend of mine had precisely a classic Wilier (I mean, he bought it decades ago and it became a classic in the while) and the “ramato” colour is brutal. Great idea to bring it back. Absolutely! It is one of those things that grow on you, at first you instantly dislike it but then you find yourself liking it more than a lot. The combination of the finish and the colours is amazing, garish but not too farish, flamboyant but not too flamboyant. The Wilier Triestina – Selle Italia jersey is the perfect accompaniment. It’s style as suddenly and as radically redefined as the legandary graphic design Italo Lupi created for Cinelli! PS I thought the paintjob is called “cromovelato”and also available in other colours) while “ramato” refers to the particular and classic bronze colour of the bike with a metal frame. PPS The epitome of (Italian) style is, of course, Pippo Pozzato on his team bike – unless it is Pippo riding onto the sign-in stage on his “ramato” bike! Yes, the kind of paintjob is called “cromovelato”: after “chroming” steel, it also gets “veiled” with a thin lacquer which gives the impression that the steel itself had that colour. Steel base + chrome + lacquer. You can do that to carbon, too, but I don’t know if you actually *chrome* the carbon frame and then put the lacquer on, or if it just looks like that but they prepare it otherwise. I suppose that you could, plastic gets chromed, so maybe you could chrome the resin of a carbon frame, then put the lacquer layer on it. And yes, you can do it with more or less whatever colour (I think). Pozzato, indeed, used a blue “cromovelato azzurro Italia” bike before the “cromovelato ramato” one. “Ramato” is just a colour name, that specific bronze-orange colour, meaning indeed “similar-to-copper” (“rame”). It can be referred equally to the carbon bike, to a metal one or to whatever happens to be… that colour (typically hair). Now the process is really pure aesthetics, I believe, since chroming steel might have had a sense for a road bike (less corrosion), even if it supposed some risks, but I don’t know what does chroming add to carbon (if they really “chrome” it and don’t just make it look like that). Well, aestethics work great anyway. I hate SKY at the Tour, but I love Thomas and Landa and I was super disappointed for what happened. I’ve two remarks on this post, though. INRNG usually is very accurate, not this time. The moto bike of the police did not stop after a bend, it was in a clear straight road with visibility. Maybe you got confused with the Paris Nice 2012 crash, but here the cop picked a perfect spot. The problem was that nobody on the left payed attention to the cop, and i cannot believe that the sunweb did not point it to his capitain (Dumoulin could crash, Kelderman actually crashed…). Second, about the fairplay, Blockhaus is the toughest climb of the Giro this year. Movistar started pushing 5 km before the crash. Why should they suspend attacking when just 15 km are left? Orica’s teammanager White twitted that is not fair bla bla bla – I remember in 2016 seeing an Orica rider, Plaza Molina, with the head down pushing as hard as he could last year, after the Colle dell’Agnello, when Chaves was running towards the pink jersey and Kruijswijk was chasing after a crash. That was 60 kms far from the finish line, not 15 km. Is Orica playing the fairplay card to sell some good stories to their fans against the bad Movistar guys? C’mon… Dear INRNG, don’t buy this fairplay stories, good and true only when are about the others. It was after the bend so the riders came around the corner and didn’t have long to see what was ahead, what I meant was that this wasn’t a long road with lots of visibility ahead. Could the riders have avoided the crash, possibly but surely the moto should have been off the road and on the right? It’s true, it wasn’t very far away from the bend, yet it was 150 m ahead (given it was a police moto, I think it wasn’t by chance: 100 m of visibility is the distance you’re normally asked to place the red emergency signal on the ground when you’ve got to stop with your car on a road for a mechanical or the likes, as well as 150 m is the distance which is typically applied in Italy to put a road sign ahead of what it alerts about). 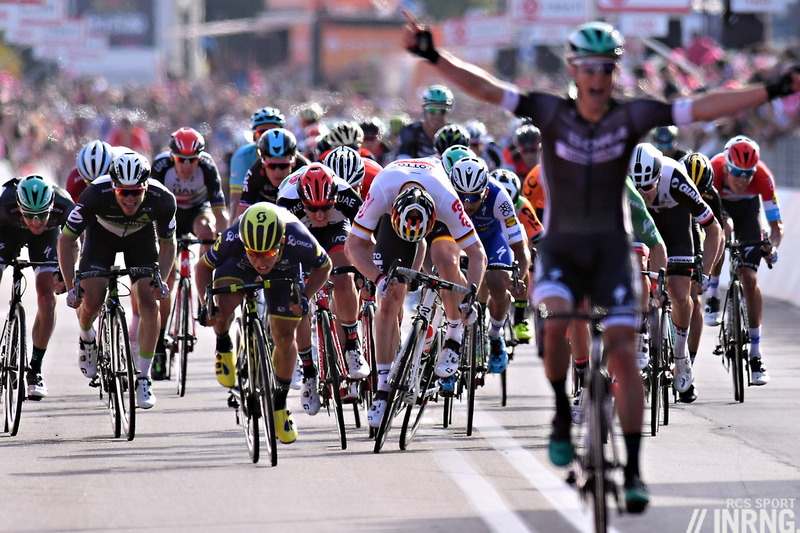 From the front shot you can clearly see that the Sky and Sunweb riders leading their respective train had their head raised and could see where they were going. What happened is that BMC had been blocking Sky on the left, then in the right bend Movistar took the inner line and BMC followed, allowing Sky to position themselves on the front… but Sunweb wanted to do exactly the same to Sky. The leading Sky riders looks left when the Sunweb rider is coming through and decides to try and keep the external line in order to make it harder for Sunweb (you can see that from the head shot, a space even opens between BMC, going for the inner line, and Sky: BMC find itself within the central road line while Sky runs along the external one). Sunweb decides to take the narrow path, right on the white line – and even out of it for a moment, as you can see from the heli shot. It’s not that “they don’t see the moto”, they’re trying to get advantage of the doubts it creates to the Sky line, as well as the Sky guys are trying to leave as little room as possible. Meanwhile, BMC closes in to the left line once again to overcome Movistar, which has to react and accelerates going for the centre. Sky riders find themselves boxed, while the Sunweb guys take their chances with the moto. The moto shouldn’t have been there and it’s the policeman’s fault, but it wasn’t an extreme danger situation until the riders decided to “play” on its limits. It’s mainly Sunweb’s fault. Sky’s problem is just that they hadn’t the legs to defend their line (accelerating when the Sunweb line put their nose in) against the aggressive Sunweb’s behaviour. This doesn’t shift any responsibility: from my POV, the policeman did something which is forbidden, the riders just did something which was risky. The difference in terms of fault is huge. Yet, it’s not serious to say that the moto wasn’t visible enough. Dumoulin’s teammates seem to have an ongoing issue with “vision”: I still remember one of them assuring all the world that he had *seen* Aru receiving an Americana shift from LLS… it was hard to say from the live TV images, and most people were crying against Astana’s cheaters and asking for time sanctions – until the heli shot showed that it simply never happened. For those readers who, like me, were stymied or momentarily puzzled by the “Americana shift”: in track cycling, it is the hand-in-hand “slingshot”given by one rider to another during a Madison (called “Americana” in Italian) race – and expressly forbidden in road cycling. Yes, on the right for sure, according to the rules, but once you see an obstacle on the left (rider who crashes with the car on the side giving assistance? Narrowing road with parked cars, Amstel-style?) as a rider you should move away and if you open the bunch move out your index and point out the danger. I think of this accident like something different from the others, more tragic, we’ve recently seen at the Flanders, Vuelta and Tour, and more avoidable, if the bunch would have payed more attention. While Yates and thomas have lost a fair chunk of time, their Giro is not over. Lets remember Nibali was 4min 30sec or so, down at the start of stage 18 in last years race. Seen a bunch of comments and pieces that seem to be a bit dismissive of Nairo’s win on Blockhaus, becuase he “only” ended up 30 seconds ahead of Pinot and Dumoulin. Thing is they can’t have been considered his two biggest rivals going in to the Giro. He’ll take plenty more time from them in the third week. The real achievement was taking a minute from Nibali already (obviously the gap to Yates doesn’t harm his chances either, but can’t say how much that would have been without the Moto). Interesting to see that Nibbles has gone electric. He famously didn’t trust it before in Grand Tours as he thought it could jeopardise his chances of winning. It’s not as if his new team are not pandering to him, and there’s little-to-no difference in reliability between Campagnolo (old sponsor) and Shimano (new kit). So why not 9100 (instead of 9150)?